The creature could smell the woods, and knew which way to go. He also knew that the little man-things wouldn't stop him. Three days ago near a corporation food production site situated in a remote wooded area, a strange creature was encountered. A large, hairy, ape-like creature that walked upright, stumbled into a patrol. Amazingly, they managed to stun and capture the massive creature with little injury to either the beast or themselves. At the food factory, excitement grows as the beast is brought in. It is thought to be a Bigfoot, a huge man-like beast of legend. The unconscious creature is quickly transported to the nearest corporate research lab. The aim is to study the ape, carrying out genetic tests, and learning all they can through vivisection. They are denied the opportunity, as during the night the Bigfoot escapes from its pen. The escape was quite clean with little damage and the Corps Officers and scientists suspect sabotage. The Bigfoot is now loose in the crumbling ruins. Other forces also seek the creature: "Sanderson" is the leader of an Eco-Terrorist network, "the Green Swords" hell-bent on bringing the Corps to ruin for abuses to the planet. He plans to release the Bigfoot back into the wild. To this end, he has recruited a local gang to help in defending and in capturing the creature. The fact that 'Sanderson' has nicknamed the creature 'Larry' doesn't fill the gangers with confidence, but the gang will be well paid for their pains and will have the pleasure of killing Corps troops. A squad of well equipped Eco-terrorists will assist the gang. Both players can pick up to 500 points value. Gang player must have one squad of Terrorists (which can be picked from the Corporate Squads equipment and weapons lists). These totals do not include Bigfoot. In addition, the eco-terrorists will have one tranq pistol (fires as a heavy pistol). If tranq'ed, Bigfoot will collapse in 1 round. The Corporate player seeks to kill the Bigfoot and take charge of the carcass. They gain 10 points for every gang member killed and 20 points for every terrorist. The Gang's player seeks to capture the Bigfoot while keeping the Corporate troops at bay They gain 20 points for every Corps trooper killed. Either side will gain 150 points if they control the creature (or it's corpse) at the end of the game. Should the Bigfoot survive long enough to make it off the table, the gang player gets 50 points. Ideally Bigfoot should be played by a third player, but it can be controlled by the Gang player. The Corporate player sets up 6" within one table edge. The Bigfoot sets up within 12" of the same table edge, and must be in cover. The Eco-terrorists/gang sets up within 6" of the opposite table edge. The table is set up in a standard city fashion with lots of high cover (to give Mr Bigfoot a chance). A Bigfoot is a large ape-like creature that stands a massive 9 feet or 3 meters. Very stealthy by nature, it has the strength of many men and is very agile (it can move 6cm for every 1AP). The creature can master basic skills such as door opening by watching a human to it, but cannot fire weapons. It can also break down doors, drop down and pick up objects. Bigfoot can also throw large objects such as crates, rocks and bits of trees. It costs Bigfoot 2AP to throw an object. The 'Green Swords' are a terror network setup by ex-Corporate employee's who have got a sudden Eco-conscience. 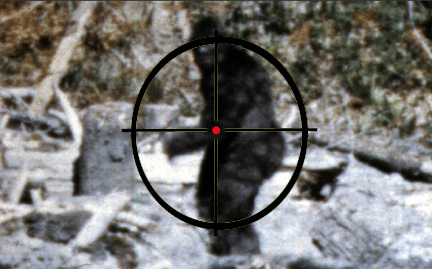 The group operates with the aid of many spies, one of whom has arranged for the Bigfoot to escape. Eco-terrorists are a well set up group: Their equipment is often of military grade (usually stolen from the Corporatie armouries). Any Corporate trooper or SWAT squad figure will suffice in this role. In addition to their kit the Eco-terrorists have Tranquilizer guns. These will fire a dart that will knockout Bigfoot. Roll to hit as normal, but a wound roll is not required. Bigfoot will collapse by the end of the turn. Note: a human getting hit by a tranquiliser dart will die of an overdose. The terrorists are idealists and therefore get a -1 to any wound dice against them. When protecting Bigfoot they are immune to psychological effects. The Corporate player should try not to be too distracted by the presence of the gang or Eco-terrorists. It would be advisable to pour as much fire onto the Bigfoot's position as possible in the hope of hitting it. After all, the beast imay just forget about freedom and decide that it wants to rip your arms off. . As soon as it is out of cover give it all you have. If the Bigfoot manages to evade you then concentrate on the terrorists. Keep them from tranq'ing it so you'll have a chance to kill it. If they do manage to tranq it, try to capture the slumbering monster. The gang player should use the terrorists to close in on and protect the Bigfoot. Make use of the gangs to keep the troopers distracted and too busy to press their attack.. Try to tranq Bigfoot as soon as possible, but try to so in cover. In the advent of the Troopers trying to take the unconscious Bigfoot the terrorists should be willing to die saving him. will also pick up objects to use as weapons in close combat and adds +1 to attack and wound dice when he uses an improvised weapon. Any squad member engaged by a Bigfoot in hand-to-hand must roll for suppression. is a master of moving unobserved and can also blend in amazingly to his surroundings. All to hit rolls on a stationary Bigfoot are subject to a -1 modifier. Bigfoot in parks and gardens gain a -2 modifier, as this is closer to their natural environment. can climb 6cm for 2AP up most vertical surfaces. is not scared of weapon fire and will not attack Humans behaving in an unaggressive manner. cannot hide from dogs. All Dogs fecome frantic when smelling a Bigfoot, barking like crazy. Guard and Attack dogs can attack Bigfoot. Wild/Feral or pets will flee and must take a suppression test when faced with a Bigfoot. is not scared of Dogs. fears bright lights. When exposed to a bright light the Bigfoot must take a suppression test. If failed the Bigfoot flees. is immune to all other psychological rules. These rules can be used in a Yeti encounter. Generally Bigfoot and the Yeti are similar animals (although the stories/legends of Yeti's seem to be far more aggressive) so any Yeti miniatures will suffice. At a push a Gorilla or Orang-utan would also suffice for your Bigfoot. You might even find a cheap plastic one in a thrift store. Tranquiliser dart gun - Eco-Terrorists only.